Flash storage is one of the most important component of a smart phone, and with every new version comes higher memory capacity and performance. 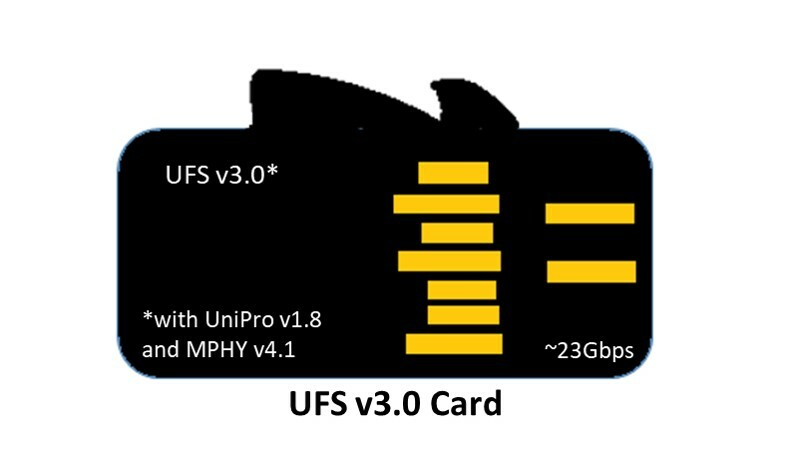 The most rapidly adopted flash memory technology in recent years is Universal Flash Storage (UFS), with UFS v2.1 providing a maximum data rate of ~11Gbps. JEDEC has come up with the faster next-generation UFS v3.0 which uses MIPI UniPro v1.8 (Unified Protocol) and MIPI M-PHY v4.1 as interconnect layer. UFS v3.0 can achieve the highest data transfer rate of ~23Gbps by utilizing two available MIPI M-PHY v4.1 transmission lines of MIPI UniPro v1.8. MIPI UniPro is a high speed and low power mobile chip to chip interconnect technology. So, if you are working on flash memory products, it is the right time to check out what’s new in MIPI UniPro v1.8. In previous blogs we have covered MIPI UniPro features and verification challenges. 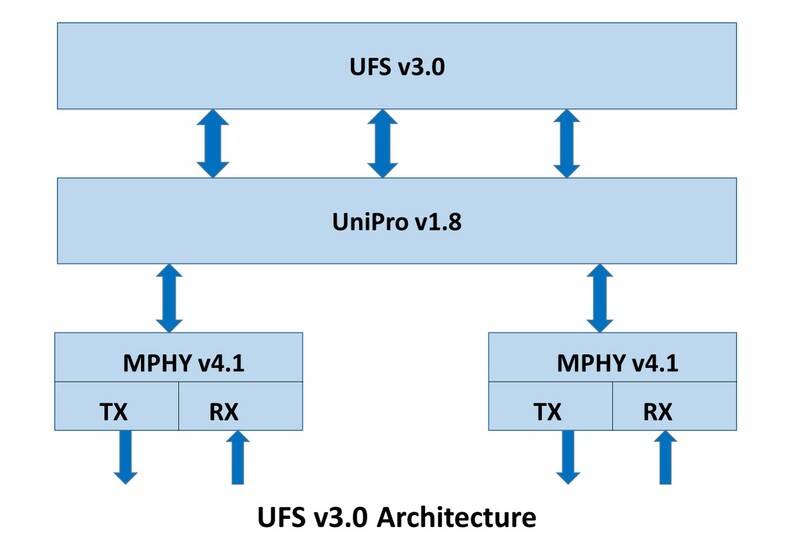 In this blog, we will focus on key features introduced in latest generation of MIPI UniPro v1.8 and its physical layer MIPI M-PHY v4.1, as well as how it enables UFS 3.0 to achieve up to 23Gbps. MIPI M-PHY v4.1 introduces new high speed gear (HS_G4 gear series A/B= ~10Gbps/~11.6Gbps) which is 2x faster than the highest speed supported by the previous generation, MIPI M-PHY v3.1 (HSG3 gear series A/B = ~5Gbps/~5.8Gbps). MIPI UniPro v1.8 can achieve data transfer rate of up to ~40Gbps/~46Gbps with MIPI M-PHY v4.1 by initiating data transfer on all 4 lanes. PA_LINKSTARTUP_TIMER is restarted upon receiving the first TRG_UPR0 symbol from the peer device following the local PA_LM_LINKSTARTUP.req. This timer re-start mechanism serves to cover-up the delay between host and device link startup request start time. To support the exchange of the new highest speed (i.e. HS_G4) and its timing parameters among MIPI UniPro devices, a new pacp capability frame is added to carry local MIPI M-PHY TX maximum high-speed gear (up to HS_G4) capability, and local MIPI M-PHY RX prepare/sync capability of HS_G4 gear and adapt_length capability values. This frame is transmitted after phase4 and before transmitting PACP_CAP_EXT1 frame. In this version, LCC is disabled, so the dummy burst assertion during power mode change (DME_POWERMODE.req) and the link re-initialization(PA_INIT) process is removed. However, dummy burst should be asserted on inactive lanes while transmitting PACP_PWR_REQ/PACP_PWR_CNF frame after performing a line reset during the retry process of both power mode change and link re-Initialization process. MIPI M-PHY v4.1 – Before receiving data stream in HS_G4 gear, it might require MIPI M-PHY RX equalizer to perform additional training sequences to adapt its filter characteristics to the channel. MIPI M-PHY v4.1 introduces the new BURST state called ADAPT to perform this process for a specified adapt length time, the provision to initiate adapt substate is then left to protocol running over MIPI M-PHY. It’s the responsibility of the higher layer protocol over MIPI M-PHY to check MIPI M-PHY RX equalizer capability and to perform the adapt process with the appropriate adapt length after configuring MIPI M-PHY power mode to HS_G4 gear, and before receiving high speed data stream. MIPI UniPro v1.8 – With a successful power mode change process to HS_G4 gear on inbound or outbound lanes, the MIPI UniPro PA layer is supposed to hold PA_DL_RESUME.ind generation and perform adapt process (if MIPI M-PHY RX supports it and power mode change process involves adapt), before initiating any new HS_BURST for further data transfer. If adapt request is present on outbound lanes (PA_TxGear = HS_G4 and peer MIPI M-PHY RX supports adapt), MIPI UniPro configures all active MIPI M-PHY TX lanes TX_HS_ADAPT_LENGTH attribute with adapt_length (refresh/initial length) value, and M-LANE-AdaptStart.req is issued. Adapt TX process completion is indicated from MIPI M-PHY TX lanes through M-LANE_AdaptCompletion.ind. If adapt request is expected on inbound lanes (PA_RxGear = HS_G4 and local MIPI M-PHY RX supports adapt), active MIPI M-PHY RX lane’s RX_ADAPT_CONTROL attribute is configured with adapt type(refresh/initial) value. Adapt RX process completion is indicated from MIPI M-PHY RX through M-LANE_AdaptCompletion.ind. This whole RX adapt process is monitored by PA_ADAPT_TIMER (10ms), and if a time out occurs it will lead to a DME_POWERMODE.ind (PWR_FATAL_ERROR). This new feature involves counting error events such as number of NAC frame received, CRC error frame received, PA_INIT.req, and PA_INIT.ind primitive generation and comparing them against the number of correctly received or transmitted bytes. When these error events reach a certain threshold, DME_QOS.ind primitive is generated from MIPI UniPro to let the application layer know the number of link repair attempts made as a part of the error recovery mechanism. This feature enables the application to analyze the reason behind reduced link bandwidth due to repeated error recovery mechanism and it can help the link repair mechanism. MIPI UniPro v1.8 comes with several other improvements and bug fixes over its predecessor MIPI UniPro v1.61. MIPI UniPro v1.8 also provides backward compatibility to MIPI UniPro v1.6x. Backward compatibility is not maintained for versions 1.41 and earlier. Unified Memory Extension (UME) further enables UFS devices to use UFS host memory as a cache to store logical to physical address translation tables, thereby reducing the requirement of device-integrated RAM. For more information on UME, read our blog – Higher Mobile Storage Performance at Lower System Cost. Synopsys provides next generation native SV/UVM based VIP for MIPI UniPro v1.8, MIPI M-PHY v4.1 and JEDEC UFS. To learn more about our VIP, please visit http://synopsys.com/vip. This post is filed under Automotive, eMMC, Flash, Memory, MIPI, Mobile SoC, ONFi, UFS.